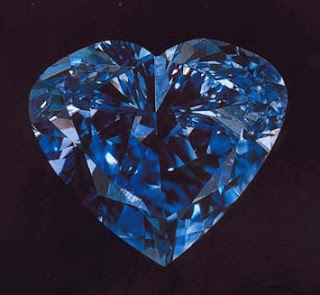 The Heart of Eternity, one of the finest heart shape blue diamond in the world, is an exotica! It is a Type IIb diamond, exceedingly rare for blue diamonds. As is usually the case in blue diamonds, it was cut from a very fine rough specimen, one found in the De Beers Premier mine in Zaire. Fancy blue diamonds contain impurities of boron, which result in their blue color. Usually the blue of a diamond is strongly modified by gray or black. Few stones have intense, saturate color distributing evenly across the stone. As we all fine jewelers agree, the color of fine gemstones, whether rubies or diamonds, is often not evenly spread throughout the stone and that, occasionally, parts of a blue stone may be totally white. To get a beautiful pure blue stone is truly a professional challenge & an accolade to the master cutter. The rough specimen was found in Zaire, a huge stone of over 777cts. which was ultimately cut into 3 pieces & later polished into 11 stones. It took cutters 3 years to cut & polish the diamond, in fact special customized equipments & stangs had to made to protect the stone from dust settling on it & scratching the surface.The cutters received the ultimate compliment when former De Beers Chairman, the late Harry Oppenheimer, undoubtedly the doyen of the diamond industry and who has probably handled more important diamonds in his 70-year career than any other person in the world, described the Millennium Star as "the most beautiful diamond I have ever seen." Currently this heart shape blue diamond is known to be in the collections of a private collector. The name seems to reflect not only the beautiful heart shape of the diamond, but also the eternal character of diamonds that have lasted for almost 3-4 billion years, and may continue to exist eternally till the end of time because Heart of Eternity is truly a one-of-a-kind diamond & mankind would be lucky to see another similar stone again.